I’m writing this in a cab, on my cell phone, on my way to the airport…. What? I’m totally not a procrastinator…ok maybe a little. Well anyway, one of the benefits of being a procrastinator and someone who loves to cook, is you get very good at figuring out meals that can be made in very little time. 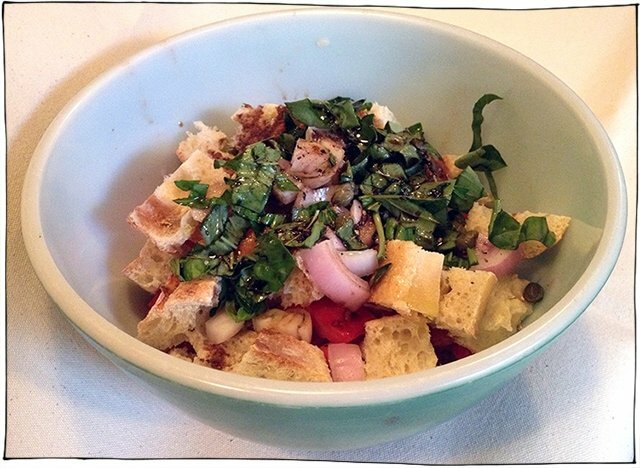 This Tomato and Bread Salad is a classic Italian dish. I first remember eating it in Sicily, in a restaurant where the door was put on crooked. 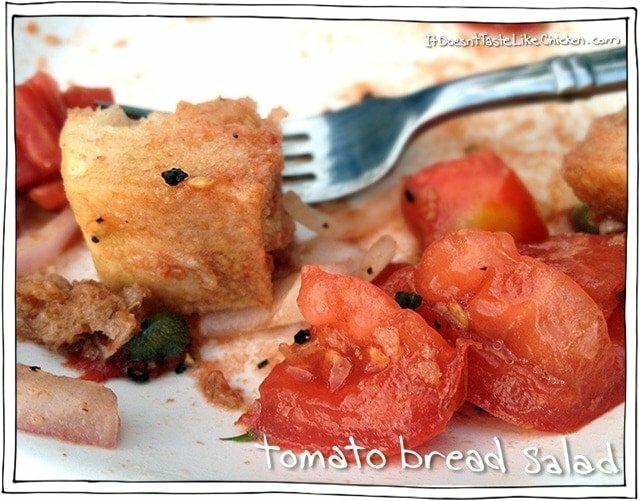 Who knew old bread and tomatoes could taste so good! …well the Italians apparently. And now me too. And pretty soon you too! My parents spoiled me by letting me raid their garden so I snagged these delicious organic tomatoes and garlic. Yummy! oh yeah, the recipe. 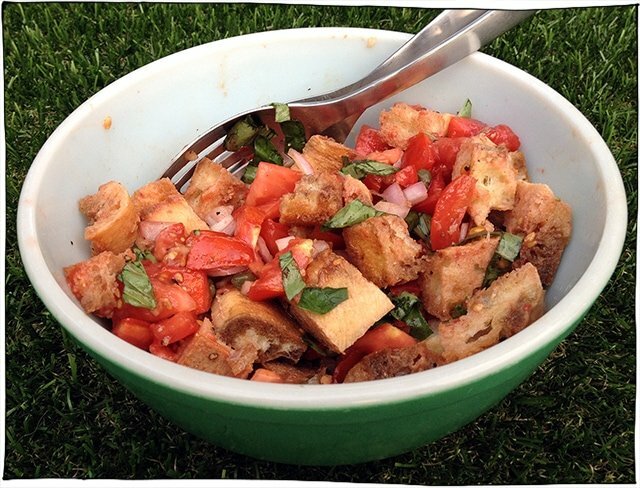 To make this salad simply chop up the tomatoes and bread into similar sized cubes. You want more tomato than bread ratio. Chop your onion, finely mince your garlic, and chop up your basil. Toss it all in a bowl, drizzle with olive oil and balsamic, and season with salt and pepper. Toss it up! The bread will start soaking up all the juices and taste amazing! Serve right away. (Or if your bread is really stale, let it sit and soak for about ten minutes before serving). Just made this salad with tomatoes from you know who’s garden and it is absolutely delicious!!! You will be pleased and proud to know that I confidently added a couple of just picked farmer’s cuckes and wish I had made more. 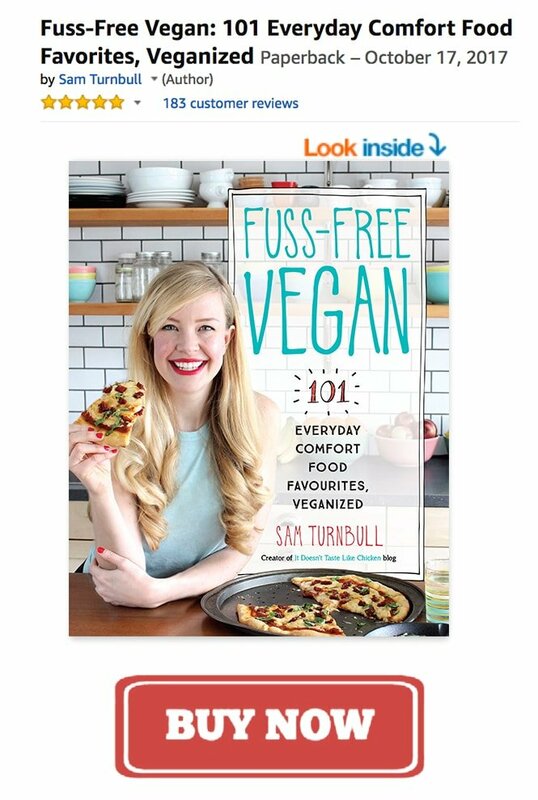 Terrific recipe. Thx, Sammie. The restaurant was Il Cibreo in Florence. But the door was crooked. I have always been better at remembering food than remembering geography! Delicious! Field grown Ontario tomatoes are as good as they get. 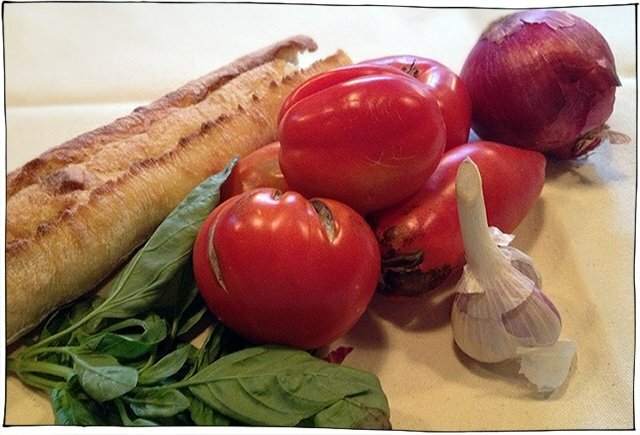 I prefer a typical Italian white bread and lots of olive oil and Basil. Yum ! !